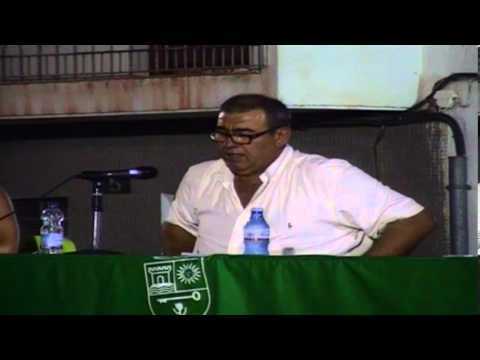 A radio interview from 2010 is currently doing the rounds in Turre where the current Mayor, Arturo Grima, appears to admit to having evaded tax by paying €60,000 from townhall coffers towards the town fiesta in 2007 without declaring taxes. Arturo was Mayor of Turre from 1995-1999, when he was barred from re-election for 8 years for abuse of office during his term. He promptly returned as soon as the Law allowed in 2007, when he governed for 2 years until a coup was held and he was kicked out. He then returned in the 2011 elections and currently continues to reign as the PP incumbent. So after the 2008 coup, the PSOE who got started sniffing around for scandal and alighted upon irregularities in the 2007 fiesta budget. They didn’t make any formal accusations – they had just as much to hide if it came to formal muck slinging – but instead slipped the information around the town that money had gone missing. [Interviewer] The townhall does that? [Grima] It’s the truth, it’s the truth, and since it’s all paid without IVA… why, our townhall charges IVA on all its water bills… and the townhall never made an IVA declaration! What Grima appears to talking about is the allegation that he originally signed a contract with the bands for the village feria, as well as several other services pertaining to the feria, and then negotiated a discount by paying everyone in cash, meaning it didn’t go through the books and the people receiving the money didn’t have to pay any tax on it. Apart from the obvious legal implications of tax evasion (hey, it’s Spain, who cares right?) it does show why Turre is over eight million euros in the red – incompetent management by the last succession of Mayors who spend money without bothering to follow any procedure. That’s my taxes you’re spending there! Such as the conflict of interest (if not downright unethical and illegal behaviour) shown over the redevelopment of the new fountain. As well as the €110,000 spent on the milkbottle as you enter Turre, another of Grima’s pet projects. The meaning of that milk bottle, by the way, comes from the original meaning of the word Turre, Turris, Latin for “watch tower”. It also begs the question of why the official auditors haven’t spotted this glaring omission (oh right, the townhall accounts haven’t been audited yet), and how €60,000 can just vanish from townhall coffers in cash with no receipts. Makes you wonder what else has walked out the door…. Anyway, here’s the audio clip from the interview in question if you want to listen to him again. This entry was posted in Blog and tagged corruption, fiesta, iva, tax evasion, turre by David. Bookmark the permalink.